Biodosimetry is a method for measuring the dose of radiation to individuals using biological markers such as chromosome damage. Following mass casualty events, it is important to provide this information rapidly in order to assist with the medical management of potentially exposed casualties. Currently, the gold standard for biodosimetry is the dicentric chromosome assay, which accurately estimates the dose from the number of dicentric chromosomes in lymphocytes. To increase throughput of analysis following a large-scale mass casualty event, this assay has been adapted for use on the imaging flow cytometer. 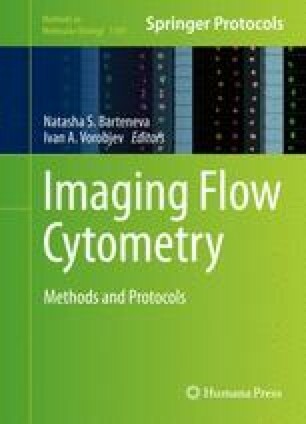 This chapter describes the methods for the identification and quantification of mono- and multicentric chromosomes using the imaging flow cytometer. The authors gratefully acknowledge the help of Catherine Ferrarotto for help with the sample preparation. This equipment was purchased through a Canadian Safety and Security Program Technology Acquisition Project.